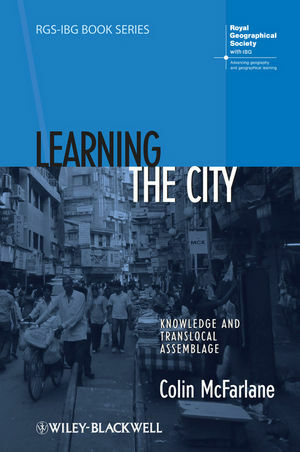 Learning the City: Translocal Assemblage and Urban Politics critically examines the relationship between knowledge, learning, and urban politics, arguing both for the centrality of learning for political strategies and developing a progressive international urbanism. Colin McFarlane is Lecturer in Human Geography at Durham University, UK. His research focuses on urban geography, especially theorising the intersections between urban inequality, materiality, and knowledge. “Urbanism, McFarlane believes, needs a theory of learning; throughout his book he builds a very sophisticated one…[he] brings us closer to the material stuff of urban life and politics…a kind of urbanism in motion, whereby what we come to term ‘knowledge’, ‘infrastructure’ and ‘resources’ are never simply ‘there’, but must be translated, distributed, coordinated, perceived and inhabited”. (International Journal of Urban and Regional Research, Volume 38.1, January 2014).